Named for prominent The Ranchmen's Club member Richard Bedford Bennett (1870-1947), this recently renovated premier space is located at the East end of the third floor and is the Club's largest banquet room, accommodating up to one hundred and twenty guest, depending on the requested room set-up and the audiovisual equipment required. This room features some of the most dramatic art from the Club's art collection and can be divided into two smaller rooms with a retractable sound-proof partition wall. R.B. Bennett was Canada's 11th Prime Minister, and a founding partner of the Bennett Jones LLP international law firm. He lived at the Club during various times when the third floor was used for accommodation. A Canadian lawyer, businessman, politician, and philanthropist, he served as Prime Minister of Canada from August 7, 1930 to October 23, 1935. These were the worst of the Great Depression years, after which he moved to England and was later elevated to the peerage as Viscount Bennett. We are confident he would be proud today of the room that bears his name! 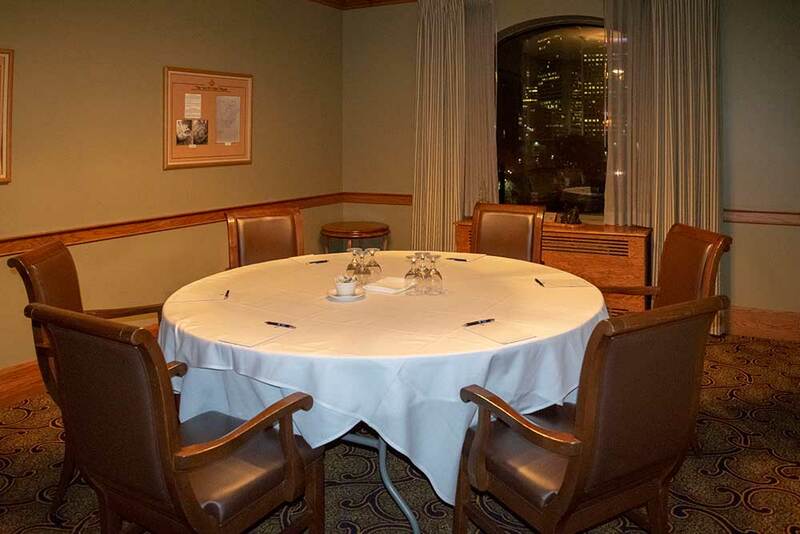 The Lougheed Room, located on the South side of the Club's third floor, acts as The Ranchmen's Club's Board Room. 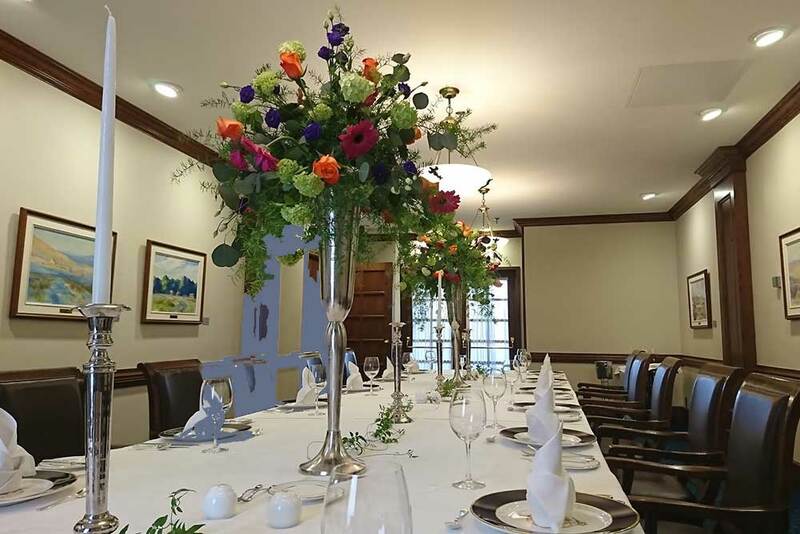 Overlooking the historic Lougheed House & gardens located directly across the street, it seats sixteen guests around a fixed large square boardroom table. 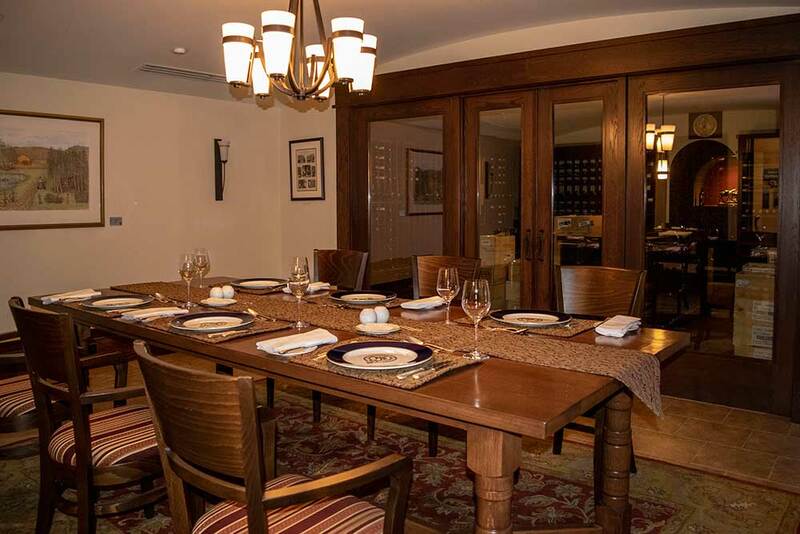 It is an ideal private room for meetings, conference calls and family dinner parties. 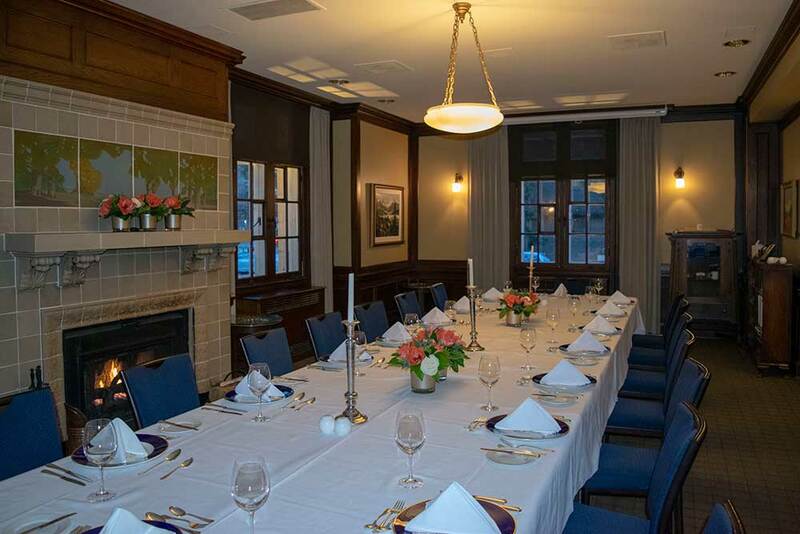 Named for Sir James and Lady Lougheed, this is a favorite private room of the Club's members and of the well-known Lougheed family. The Lougheeds have been listed on the Club's roster for four generations - including former Alberta Premier Peter Lougheed. The art featured in this room includes works done by Premier Lougheed's niece, Deborah Lougheed Sinclair. 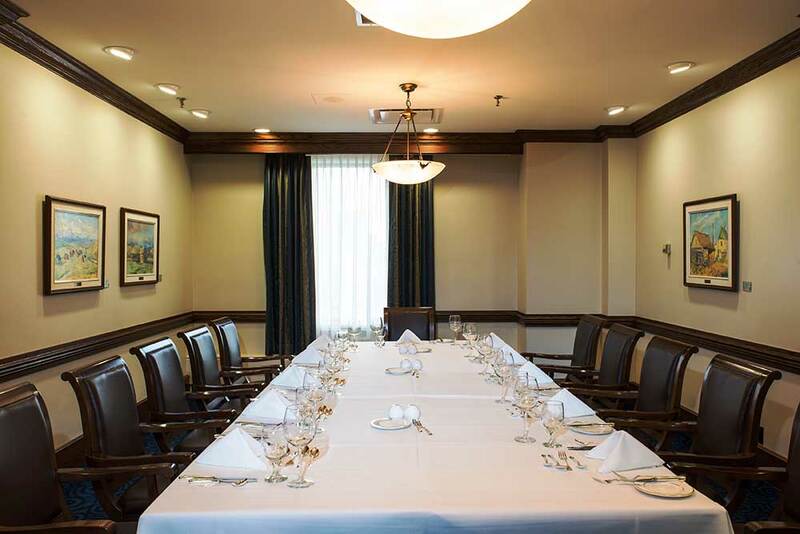 The Glenbow Room is a small private dining and meeting room seating up to ten people located on the North side of the Club's third floor, opening into the Cochrane Lounge. This space is named for the Harvie family's Glenbow Ranche, which was carved from the vestiges of what was once the historic Cochrane Ranche. The Glenbow Ranche was purchased by The Ranchmen's Club member Eric Harvie in 1933, who in 1947 won the ultimate Alberta lottery -- he owned the mineral rights to Leduc No. 1, the well near Edmonton where oil was discovered in 1947, ushering in Alberta's petroleum era. The bonanza motivated Eric, a Calgary lawyer, to support the creation of the Glenbow Museum, the Banff School of Fine Arts, Banff's Luxton Museum, the Calgary Zoo, Heritage Park and the Devonian Foundation. 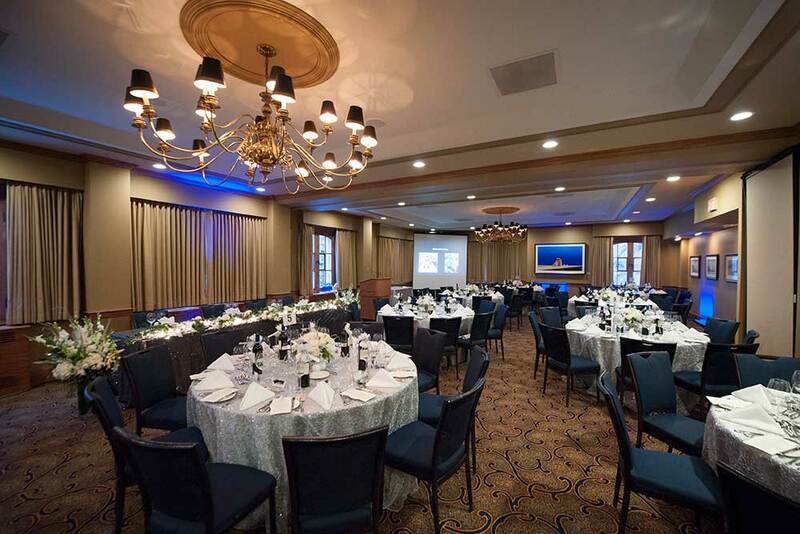 This is the Club's second largest banquet room and is located at the West end of the third floor. It can accommodate up to one hundred guests, depending on the requested room set-up and audiovisual equipment. With the retractable sound-proof partition wall, the Harford can be divided into two smaller rooms, providing even more options for use. The Harford Room is named for one of the Club's founding members, Hugh Wyndbram Luttrell Harford (1862-1920). A banker and the son of a wealthy British family, he sought adventure on the frontier and for a brief time in the early 1890s, he ranched near High River in partnership with Herbert Samson (namesake for the Samson Lounge on the second floor). In 1895, Harford sold his shares and moved back to England where he succeeded his father in the banking business. 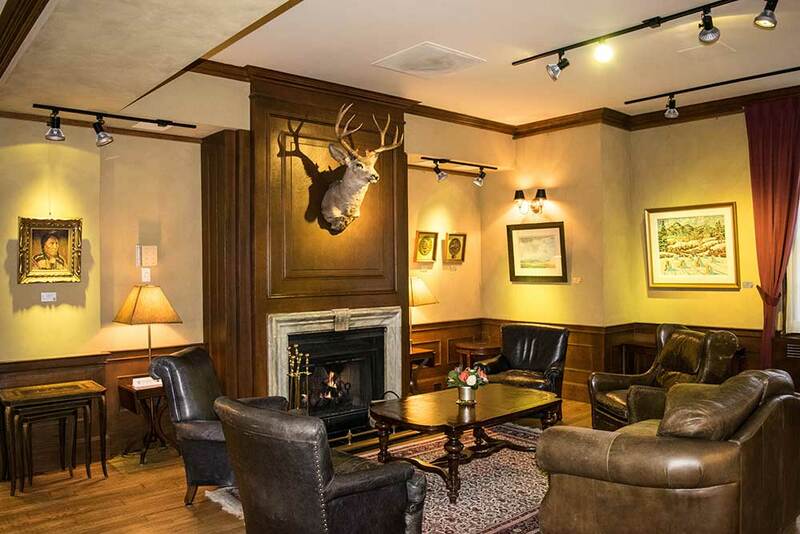 The Cochrane Lounge is a large multi-purpose space located in the center of the Club's third floor and features skylights, a fireplace and a full-service bar. Finished in a warm and luxurious décor, it is perfect by itself for stand-up receptions or used in conjunction with the Bennett, Glenbow and Lougheed Rooms for pre-dinner cocktails and for buffets. This room is named for the famous Cochrane Ranche, the site of Alberta's first large-scale ranch that operated between 1881 and 1888. The Cochrane Ranche consists of archaeological remains and landscape features on approximately 137 acres overlooking the Bow River, located in a sheltered valley on the West bank of Big Hill Creek and West of the Town of Cochrane. The Jephson Room is the largest of the three private dining rooms located on the second floor, in what was originally one large Ladies Dining Room. 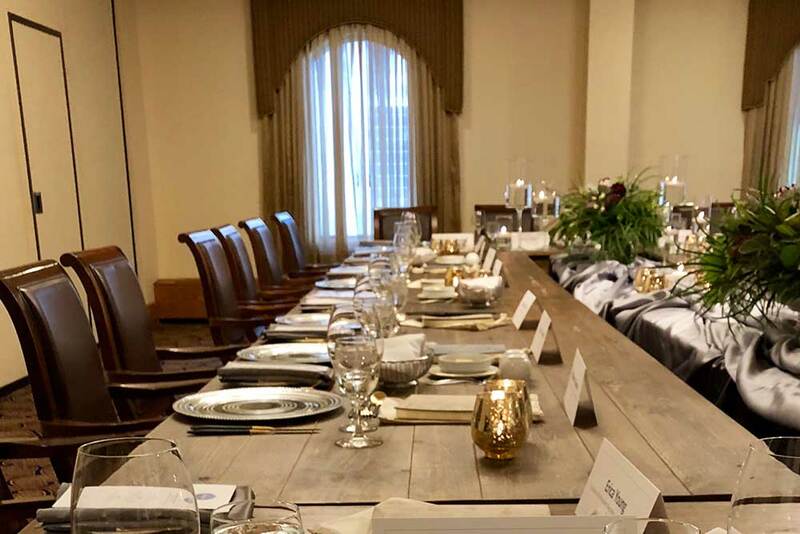 This multi-use room can accommodate three tables of eight for a dinner event or seminar or one large, double width meeting table for twenty-four. This room is named for founding member John Pascoe Jermy Jephson, (1855-1923) who was a charter member of The Ranchmen's Club, serving as our first Secretary, and our President from 1902-1906. 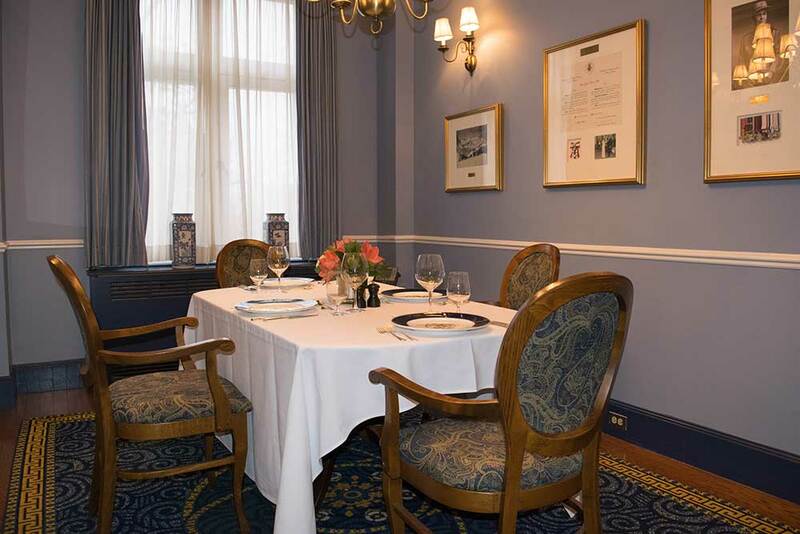 The McPherson Room is the mid-sized room of the three private dining rooms located on the second floor. It can accommodate up to sixteen guests depending on the room set-up. Named for Duncan Haldane MacPherson (1864- 1939), a rancher and one of the founding members of The Ranchmen's Club. In the founding year of the Club, 1891, he served as Vice-President. MacPherson. He incorporated the High River Horse Company to raise horses, sheep and cattle and established a ranch near his friend's Herbert Samson and Hugh Harford (also members of The Ranchmen's Club who have rooms named after them). The Smith Bedroom is the most intimate of the three private dining rooms located on the second floor, seating up to ten guests around a fixed, large round table. Finished with fine antiques and a bedroom dresser as a sideboard, it is ideal for family dinners or a small meeting. The naming of the room as a bedroom relates to the Club's history of having bedrooms on the third floor of the Club and 'Smith's Bedroom' as the spot where members would have been able to legally secure an alcoholic beverage during the prohibition years. All three private dining rooms (Jephson, McPherson and Smith) feature a collection of seventeen oil-on-canvas paintings of ranches by O. N. (Rick) de Grandmaison, one of the sons of Nicholas de Grandmaison. These rooms are fully equipped for audio-visual services. The Mary Dover Room is located in the sunny Southeast corner of the second floor, adjacent to the A.E. Cross Dining Room. 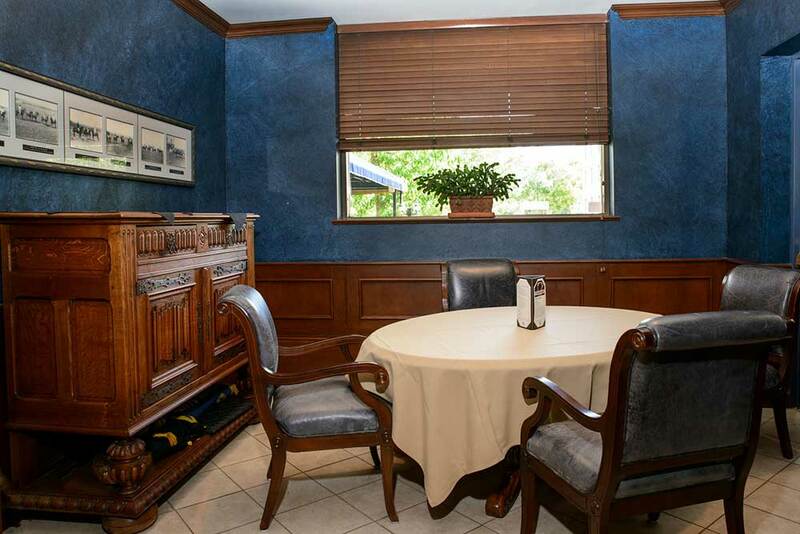 It is a small private dining room that comfortably seats up to six guests. 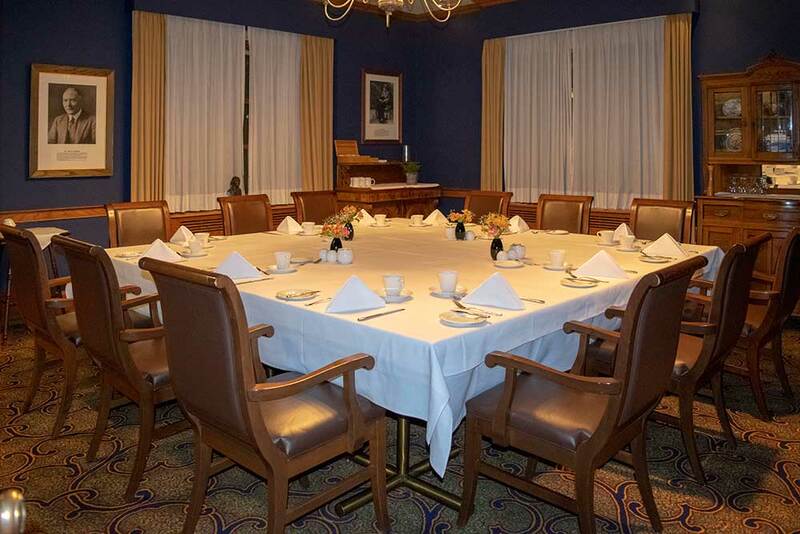 This popular room is named for Mary Dover, the daughter of founding The Ranchmen's Club member A.E. Cross and his wife Nell Macleod, the daughter of Calgary's founder Col. James Macleod. It features a painting of Mary in her ranch's garden, her O.B.E., and a number of medals awarded to her for work as chief recruiting officer while a Major in the Canadian Women's Army Corps during WWII. Mary Dover's family are still active members of the Club. The Samson Lounge is a multi-purpose lounge and bar located on the second floor, servicing the three private dining rooms, A.E. Cross Dining Room and Mary Dover Room. 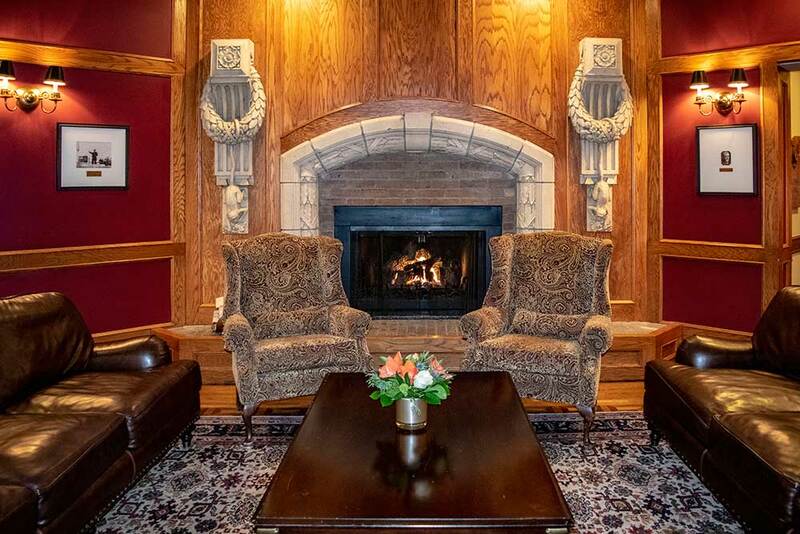 Complete with a variety of groupings of soft-seating and a beautiful gas fireplace, this lounge is an ideal spot for small intimate receptions of up to fifty guests, as well as for pre and post dining cocktails. With the dedicated art gallery quality lighting , this space features a good portion of the Club's art collection. Named for Herbert Samson, a founding member of The Ranchmen's Club, he was an original investor in A.E. Cross's Calgary Brewing and Malting Company, and an officer in the Alberta Stockgrowers Association. In partnership with fellow The Ranchmen's Club founder, H.W.L. Harford from 1886-1895, he owned the Bar XY Ranch. Known as the best polo player in Fort Macleod, the Oxford-educated Samson was from a British family prominent in banking. At the onset of the Boer War (1899) he sold the ranch and volunteered to serve in the Imperial Yeomanry. At the end of the Boer war he remained in South Africa to farm. 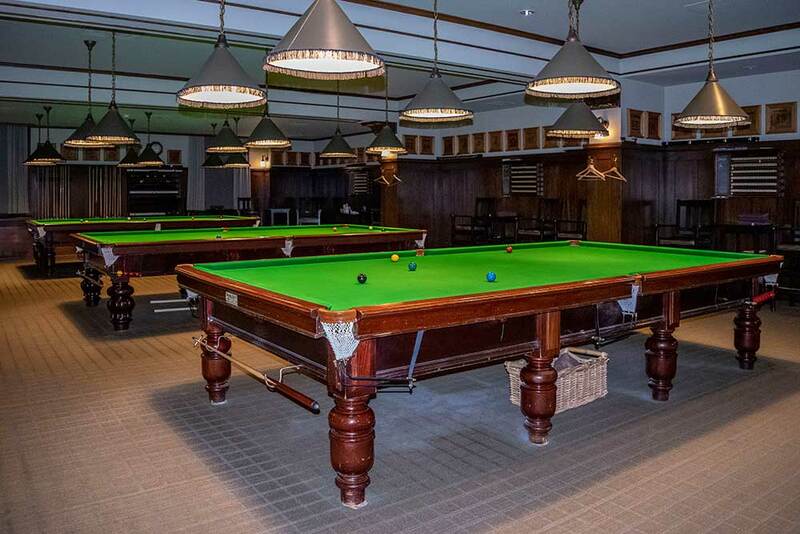 The Billiard's Room is a long-time member favourite. Located on the main floor, adjacent to the Wolves Den, it features three, turn-of-the-century, 6' x 9' championship billiards tables. The north-end has card tables and a TV with full cable services to enjoy while having lunch from the 8-Ball Buffet; offered within the room during weekday lunch service. 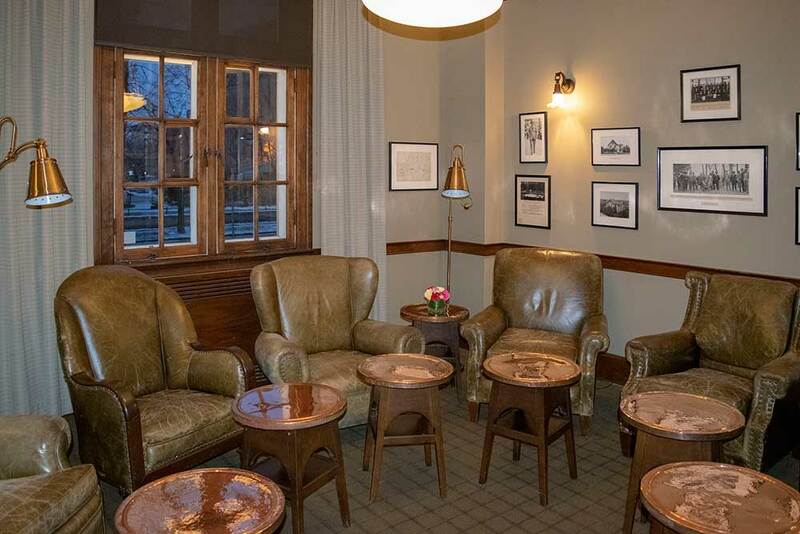 The North Lounge is located in the Northeast corner of the main floor in the original 1914 section of the Clubhouse. Formerly used as a reception-sitting room for members prior to heading upstairs via the grand staircase to the second-floor dining room, the gas fireplace and wood paneling featured in this room provides historic comfort for any event. 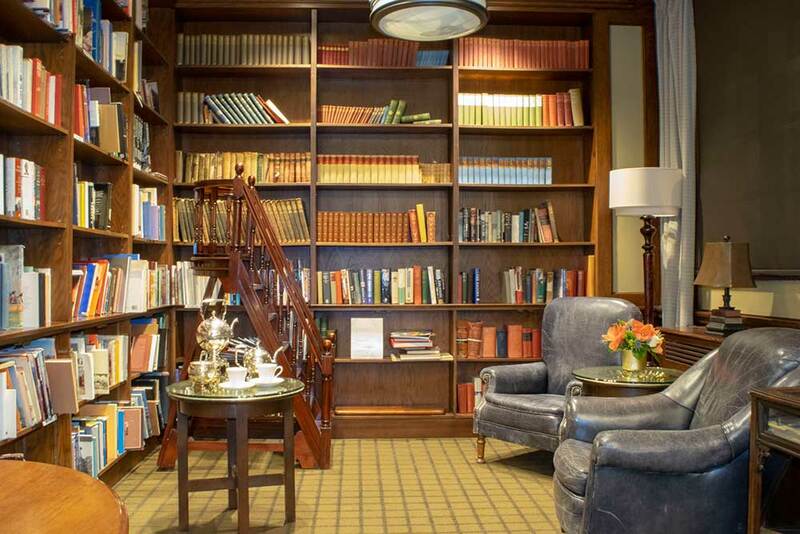 Located on the main floor, in the Southeast corner of the original 1914 section of the Clubhouse, this space is open to members for casual use - relaxing or reading books or magazines that are displayed in the room. There is a desk for quiet work. On occasion, this room is also used for private functions, small receptions or dinner parties. Please contact the Catering Department for availability. 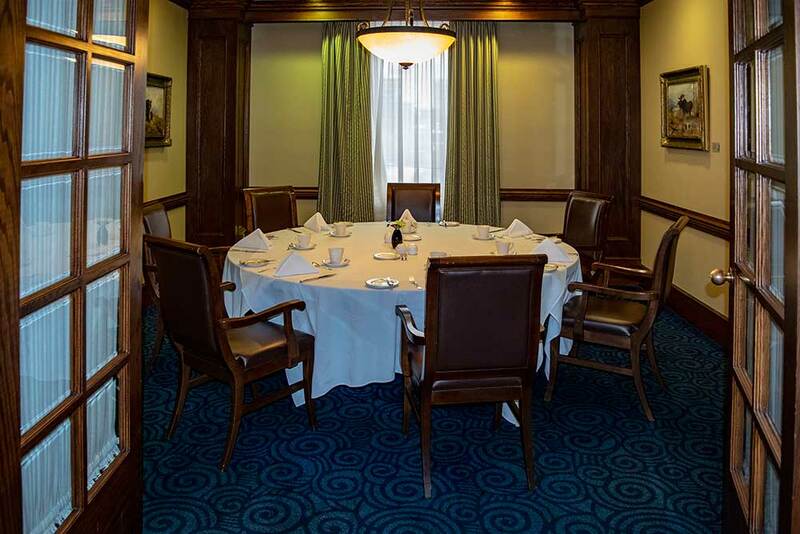 The Kremlin room is located on the main floor of the Clubhouse, is an ideal private room for impromptu meetings, afternoon tea, and conference calls. The semi-circle of well-worn leather chairs, the historic letters, and photos that line the walls contribute to the air of intrigue and mystery that permeates 'The Kremlin'. Although the name 'Kremlin does not appear on architectural drawings or on the door of the room itself, the tradition of a 'fortress inside a city' has a long history that predates the unofficial naming. The Kremlin was a sort of hideout for certain long-term members; every man who inhabited that place had a chair and you knew who belonged to what chair. Among the exclusive 'coterie' who occupied a Kremlin chair, was Jack J. Saucier Q.C., Club President from 1964-1966 and author of the 1975 publication, A Short History of the Ranchmen's Club (A Light Hearted Account). Lawyer Saucier was a man of and erudition who entertained fellow Kremliners with delightful stories over the lunch of soup and the Ranchmen's famous cheese traditionally served in the room. It is easy to imagine that it was the witty Saucier who compared this august body to the Kremlin of Russian origin and the name stuck. Following Saucier's death in 1986 and with the passing of the old guard, the Kremlin fell quiet. In 2004, in a move reminiscent of the glory days when admission was by invitation only, President Lester invited members lunching on their own to join him in the Kremlin on Mondays and Thursdays, to meet and mingle in the old haunt, a tradition which continues to this day. The Wine Cellar is located on the lower level, featuring a glass wall and door that opens into the fine-wine bin storage area of the cellars. Seating up to ten guests, this intimate space has its own temperature control to ensure comfort for the diners, without impacting the temperature and humidity control of the wine being stored in the storage cellar. This room features a number of wines and champagne historical pictures and artifacts. It was built with funds donated by one hundred members each contributing $1,000 - they are collectively known as the Cellar Founders. 'One of the first responsibilities of a Club is, of course, to see that its members do not die of thirst.' -A Short History of the Ranchmen's Club, 1957. The Member's Room is situated directly off of the Main Lobby and comfortably seats up to four guests for impromptu private meetings. This private room has public WiFi access, a telephone and receives food & beverage service from the Wolves Den. This room is booked through the Front Desk on the day that it is required in person, or by phone and is subject to availability.